Is Alarming Nationwide Violence Rooted in Recession? Several tragic acts of violence have permeated the papers and web sites around America recently. The Christian Science Monitor posed the question Monday if such horrors are rooted in the nation’s recession. The article by Patrik Jonsson cites several cases: gunned down officers in Oakland, California, an Alabama shooting spree, a North Carolina nursing home massacre, and a murder-suicide in Santa Clara, California. Are such cases really a reflection of anguish stemming from hard financial times? What I glean from Jonsson’s story is that there’s not really a direct correlation between tragedy and recession. But factors from an economic downturn — a lost job, a home foreclosure, a pay cut or wage freeze — simply increase the strain on those of us peddling in the economic engine. It sadly spurs some to commit unthinkable acts. Will State Close our Very Own Version of Alcatraz? The last prison in America located on a remote island is on the chopping block. 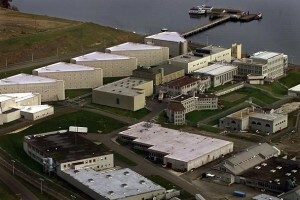 The state senate’s budget has plans to move out of the McNeil Island state prison, a 1,300 population lockup located in the pastoral south Puget Sound, the Tacoma News Tribune reports. If there’s any good news that can come from this scam, it’s that scammers appear to be more desperate these days. This one comes from a reading of the Bremerton Police reports. A 65-year-old woman called police Friday to inform them that she’d received a phone call from a man purporting to be her grandson. It so happens that said grandson has just gotten out of jail. And he needs $3,800 for jail in a hurry, so get down to Wal-Mart and send him a moneygram, Grandma. Savvily, this Grandma was having none of it. Is the city of Bainbridge Island, with all its budget troubles, looking for a nearby sheriff’s office to takeover its police department? The short answer, according to Kitsap County Sheriff’s Office spokesman Scott Wilson, is no. But there has been some talk. “There have been some inquiries made, by a number of citizens of (Bainbridge Island), to determine if the sheriff would be available to discuss law enforcement issues,” Wilson said. Wilson adds that such discussion “means of merger of KCSO and BIPD.” It does not, but “The sheriff has responded that he would certainly be open to engage in discussions if asked,” Wilson said. No meetings have been scheduled. And as for Sheriff Steve Boyer’s own position on the matter? “Today was a forward step towards hemp for victory,” declared Seattle resident Jeanne Ferguson Tuesday on the steps of the Kitsap County Courthouse. Ferguson, who founded organization “Gramma’s for Ganja,” came to Port Orchard to hear the verdict in the trial of Bruce Olson (left). And she certainly wasn’t the only one who watched as Olson was acquitted on two felony counts. “I’m appalled the prosecutor’s office feels the need to waste this much money prosecuting medical marijuana patients when there’s plenty of real crime in Kitsap County,” said Kingston resident Steve Elliot, another advocate. Elliot also penned a lengthy post that spans the trials length. And I’d encourage you to vote on our new poll, at right. The Kitsap County Prosecutor’s Office maintains it was trying a man and not the medical marijuana law. Anna Williams has vowed never to use a credit card again. The Central Kitsap resident was up skiing earlier this week, her American Express card happily in her wallet. When she came down from the mountain, she found that someone had somehow started using the card. Williams, who works as a letter carrier for the post office, speculates that a waiter or waitress who’d taken her card to pay for a meal swiped the numbers from it. In any case, she’s become a victim of identity theft. Graveside Thefts: a Growing Problem in Bremerton? 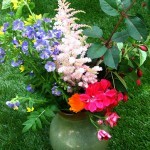 A couple weeks back, a woman reported to Bremerton Police that a flower arrangement had been “stolen” from the graveside of a loved one at Forest Lawn Cemetery. We also received a letter recently from a Georgia family appalled to learn they’d also found their flowers left behind at the cemetery gone. A police officer’s investigation — more like just simple observations — found that deer had likely considered the graveside memorials a colorful salad and had lunch. A bunch of the commenters on the same story remarked that indeed, deer, and even squirrels, had been culprits in their own gardens. 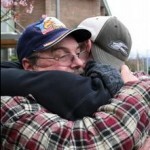 But I asked Andrew “Andy” Oakley, the Bremerton Police Department’s community resource officer and veteran cop, if the PD had actually been seeing such graveside thefts. 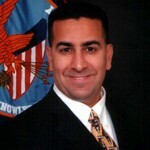 New Jefferson County Sheriff Anthony “Tony” Hernandez has law enforcement experience at both the federal and local level. Soon, he’ll get his taste in law enforcement of the political kind. The Bremerton High School ’90 graduate will take over for Sheriff Mike Brasfield next week as the Jefferson County Commissioners’ handpicked successor. “It feels great,” he told me Tuesday. But it won’t be long before Hernandez — who has been with the Jefferson County Sheriff’s Office almost eight years and has interned with both the federal ATF and U.S. Marshal’s Service — must get out and gladhand. He must run campaigns for sheriff in June 2009 in order to run the 47-deputy, $2.4 million office for the duration of Brasfield’s current term. And then, he must run again, in June 2010, to secure his own. Could Capital Punishment’s Relics ‘Spark’ Tourism? A small Nebraska town looking to jolt its tourism believes it has found an answer: the electric chair. Nebraska’s supreme court struck down the method of execution in the state last year, finding it to violate the Eighth Amendment of the Constitution. 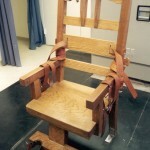 No one’s been executed in the state since 1997, but little McCook, population 8,000, believes the chair still has a place — in a museum, according to the Associated Press. 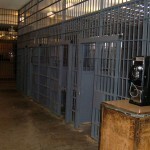 The chair sits at the Nebraska State Penitentiary, more than 200 miles from McCook in Lincoln. In its day, it electrocuted 15 people after replacing hanging in 1913. Now, Nebraska is trying to pass a bill to allow lethal injection. But here’s the best part of the story.